Use this tool to identify the acceptable price range or the optimal prices for trial or revenue, based on survey data. Available in Excel with the XLSTAT software. 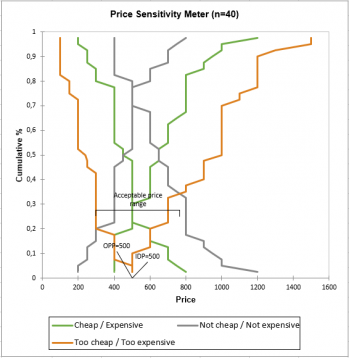 What is Price Sensitivity Meter? This version of price sensitivity analysis (and its impact on sales volume and revenue) is due to Van Westendorp and was presented at the ESOMAR Congress in 1976. It was later enriched by Newton et al. in 1993, to respond to mainstream criticism that this previous method did not take purchase intention into account. This method consists of conducting a survey on a group of panelists of consumers and asking them how they perceive the price of a specific product. 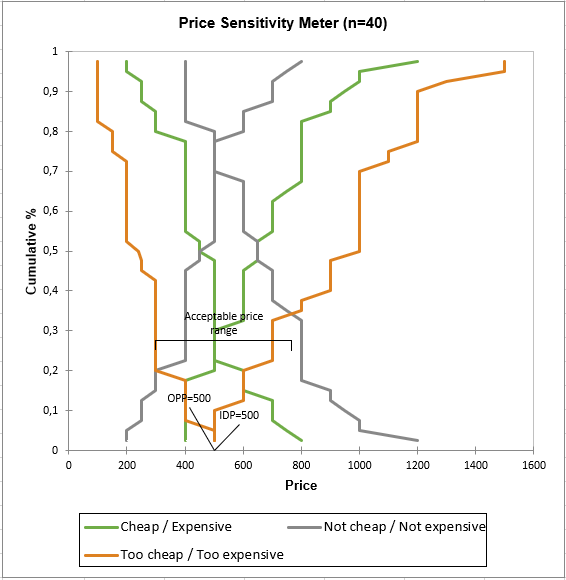 For this type of price sensitivity analysis, the usual result is a graph presenting a series of curves whose intersections determine critical prices: from the survey data, six cumulative distribution curves (or their opposites) are computed, first for the four types of prices collected (too cheap, cheap, expensive, too expensive), then, by deduction, we calculate the distribution for not cheap and not expensive. For too cheap and cheap, we take the opposite of the distribution curve. For each of the prices indicated by the panel participants, we calculate what proportion of respondents s indicated a higher price. These curves, therefore, decrease from 1 to 0 when the price increases. For expensive and too expensive, we take the cumulative distribution curve. Therefore, for each of the prices indicated by the respondents, we calculate what proportion of consumers indicated a lower price. These curves, therefore, increase from 0 to 1 when the price increases. The intersection between the cheap and expensive curves is the price for which the same number of panelists consider the product to be expensive or cheap. Even if it is not necessarily strong, there is a disagreement between these two groups of the same size of respondents on this price which has been named Indifference Price (IDP). According to Van Westendorp, this price corresponds to the reality of the market. The IDP can be interpreted as the median market price for this type of product or as the price offered by a market leader. This is the right price point for a majority of respondents, a small proportion finding it cheap (probably not expensive enough for the company marketing this product) or expensive (potentially at risk for of a concurrent). Of course, even smaller respondents will find it too cheap (suspicious quality) or too expensive (inaccessible). The intersection between the too cheap and too expensive curves is the price at which many respondents consider the product to be too cheap or too expensive. This price which corresponds to radically opposed opinions concerns a tiny group of panelists. This price is called the Optimal Pricing Point (OPP), the price point at which the purchase intent will not be impacted negatively, meaning that outside of any other external factor, few people would be discouraged by this price. The acceptable price range is given by, for the lower bound, the intersection between the too cheap and not cheap curves, and for the upper bound, by the intersection of the too expensive and not cheap curves. Between these two marginal prices, the authors estimate that sales volumes are high. XLSTAT allows to take into account the contribution of Newton et al. (1993) who proposed to take into account the purchase intent within the framework of the survey, by asking what is the purchase intent score, for the cheap and expensive prices. These scores can be transformed into probabilities, either automatically or through a conversion table. Once probabilities are available, we can identify which price is likely to generate a maximum volume of sales and which price is likely to generate a maximum revenue. The dialog box is divided into several tabs that correspond to a variety of options ranging from the selection of data to the display of results. You will find below the description of the various elements of the dialog box. Price data (TCH/CH/EX/TEX): Select the data that correspond to prices. You must either select two columns (CH/EX) or four columns (TCH/CH/EX/TEX). If a column header has been selected, check that the "Variable labels" option has been activated. Check consistency: Activate this option if you want XLSTAT to check that prices are in ascending order for each individual. Otherwise, the individual is not taken into account for the analysis. Groups: Activate this option if you want the perform the analyses per group, and then select the data that indicate to which group each individual belongs. If a column header has been selected, check that the "Variable labels" option has been activated. Purchase intent data (CH/EX): Activate this option if you surveyed the consumers for their purchase intent at the cheap and expensive prices. These data can be scores (for example on a 1-5 scale) or probabilities If a column header has been selected, check that the "Variable labels" option has been activated. The Price Sensitivity Meter chart is the main result of the method as it displays the different cumulative price curves. On the same chart, XLSTAT displays the IDP, the OPP, and the acceptable price range. If the purchase intent data has been entered, the next table shows the optimal trial price and optimal revenue price, as well as the respective average probability of purchase, expected volume on the population of the study and the expected revenue. Volume and revenue curves based on prices are also displayed. The last table shows if the option is activated in the dialog box, the probability of purchase for the optimal trials prices and turnover.